It's pretty late in the game to be shopping for any kind of gift right now—with only a couple of hours left, you've got a pretty meager list of store options to choose from, beginning with the gas station and ending with your own room. As long as you don't mind giving a facsimile of the actual gift, though, the awesome 20x200 art and print shop has you covered. For example, check out a series of images by Jenny Odell—a San Francisco-based artist who we've featured here on Gizmodo once or twice. 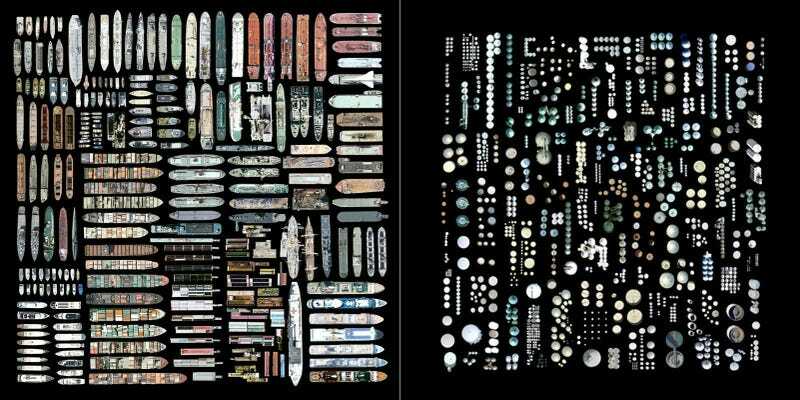 Odell culls her imagery from Google Satellite View, scouring the app for pieces of infrastructure and then surgically removing pieces to group against black or white backgrounds. There's 195 Yachts, Barges, Cargo Lines, Tankers, and Other Ships. Or 104 Airplanes. 1,376 Cylindrical Industrial Buildings is mesmerizing, too. They are "collapsed pictures of my own disoriented wanderings through the endlessness of a scanned world — endlessly scrolling, endlessly zooming in," says Odell in a statement. "But they are also, as in any collection, acts of love."